With a combination of sugar beans, black eyed beans and chickpeas, Werda’s Spicy Mexican Bean Salad is an ideal side dish or filling, helping families create traditional Mexican favourites in mere minutes. Cholesterol-free beans are packed full of protein and fibre and therefore a healthy and hearty choice. All Werda salads are vacuum sealed for convenience and require no refrigeration until opened. This Spicy Mexican Bean Salad has a shelf life of nine months. The product will be available from all leading retailers’ countrywide from April 2013 at a recommended retail price of R20,99. 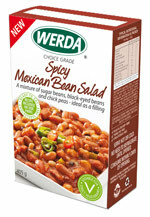 Werda’s Spicy Mexican Bean Salad packaging was designed by Creative Performance.